From our lodging north of Darwin City, the road leads past the huge Botanic Gardens. We are in the tropics for sure. It’s late afternoon and the heat and humidity have subsided. In fact a cool breeze is gently blowing, and I decide to search for the famous Darwin Sunset. At a junction, next to the Flame of the Forest, there’s an ancient cemetery – Gardens Road Cemetery – founded 1919, but no longer in use. Being a fan of ancient burial grounds, which may sound macabre for some, I decide to check this place out, not to check-in, okay? In memory of a Japanese diver, who most likely had an underwater accident while harvesting pearls. Bathurst Island is some 80km north of Darwin, which has a rich pearling history. Mortality rate among such divers then was about 50%, mainly due to shark attacks and the bends. There are Chinese tombstones too, but as I notice that the sun is already low in the sky, I hurry along towards the beach. I’m just in time, and a handful of sunset worshippers are already in position. Glorious view as the sun slowly drops into the Indian Ocean. … as a man tries to get his perfect shot. A schooner drifts along … and soon the sun is gone. … as I try to retrace my track. This is the famous Mindil Beach, northwest of downtown Darwin. Back on dry land, a reminder about the nasty jellyfish. Not to be taken lightly this; note the bit about ‘immediate and increasing pain’ … OUCH! 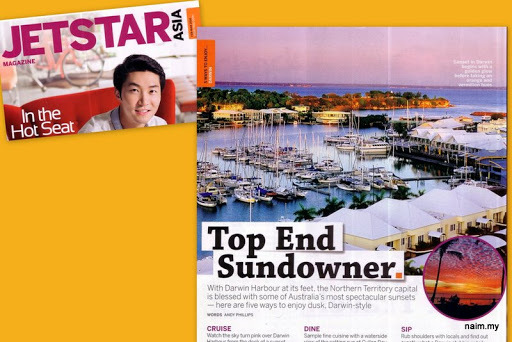 To find beautiful Mindil Beach, just look for a very famous landmark of Darwin – The Skycity, home to casino, hotel and restaurants. The beach is just behind it. I look up and see the sliver of the crescent moon in the perfect sky. It’s dusk, me no casino fan, so I trudge back to my own hotel, some 800m away. So now, Darwin Sunset, done! Beautiful sunset! I will be going to Bandung on March, have you been there before? Btw, Happy New Year to you, so where is the Tiger taking you this year, apart from Bandung? It’s actually Japanese. Tomb of Tanigawa Otozou. In australia , u see australian sunset. Try the LIdo beach in Johorbahru to see the sunset. u will not regret it. happy watching.